The best thing about this recipe is that you can customize it in dozens of ways with different sausages, cheeses, and fresh herbs. We especially like it with mushrooms and spinach. Once you have this recipe in your arsenal, you can class it up or play it down, for an easy dinner win any night of the week. The goal here is to have the sausages finish at the same time as the polenta. The polenta I use for this recipe has a one minute cooking time, although it specifically states that it is not an “instant product.” Go figure. If your polenta starts to seize up, keep it loose with the addition of more stock, water, butter, or olive oil. Because I want the polenta perfectly creamy and ready to go when the sausages finish, I don’t start prepping this polenta until the sausage is in its final cooking stage. Brown the sausage chunks in the olive oil over medium heat in a 12″ steel skillet. When the sausage nuggets are a nice golden brown, take them out of the pan. There will be some nice fond (or sucs) in the pan that we will deglaze and make into our sauce. Add the onion slices and garlic to the hot pan, seasoning lightly with salt and pepper. The onions will start to look brown quickly as their liquid releases and loosens the fond in the pan. Use the onions to scrape up the fond, then pour in the vermouth. It will have a nice sizzle. Scrape up any last bits that are stuck to the pan. Add the sausage back into the pan, lower the heat, and simmer for about 15 minutes. Boil your stock and water. Grate fresh parmesan onto wax paper. Stream in the polenta and stir until the polenta thickens, add more stock or water to loosen it if necessary. Pour in the cream and add the butter, continue to stir until you have your desired consistency. Off the heat stir in about 3/4 of the parmesan. 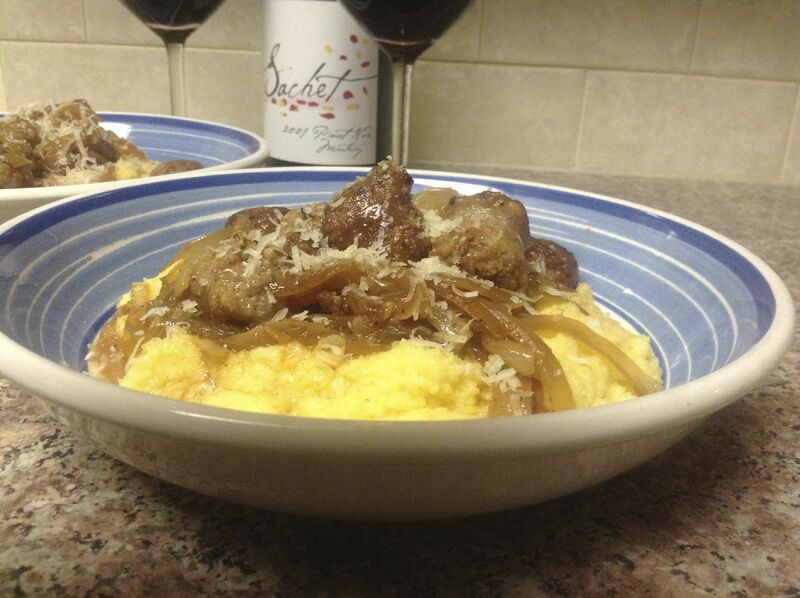 To serve, scoop the polenta into bowls and spoon the sausage and onion mixture over the top. Sprinkle with the remaining parmesan and eat immediately.